A couple weeks back when I thought my column writing days were numbered, I had a bit of a panic because I came very close to blowing my opportunity to write about one of the nicest people on the planet. 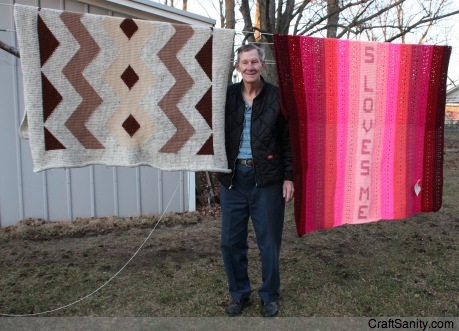 A newspaper reader had sent me a tip about Bob Roskamp, an 82-year-old West Michigan man who crochets blankets for charity, and I took my sweet time following up. As the clock ran down on my old newspaper contract, I knew I had to move fast if I wanted to make good on my promise to write about Bob. I reached Bob the day before he was headed out of town and I still can’t believe he agreed to do an interview on such short notice. A couple hours after my initial call I was in his kitchen. He got out some of his blankets and showed me the albums where he keeps photos of all 400 plus blankets that he’s made for charity. 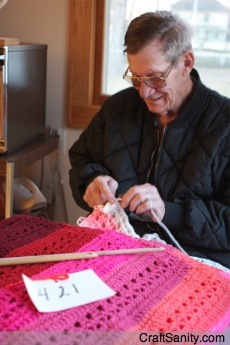 His crochet skills are impressive and his passion for helping others is inspiring. If he can stitch hundreds of bed-sized blankets to give away to orphans, I can’t help but wonder what could happen if more people approached charity crafting with even half as much gusto. You can read Bob’s story here. It ran in on the cover of Monday’s edition of The Grand Rapids Press. If you know about an extraordinary crafter like Bob, please let me know. My column is continuing (Yay!) and I’m always looking for inspiring people to write about.